Synopsis-In this rhyming picture book, a mischievous boy named Rudy comes across a mysterious creature after he falls into a sinkhole. He is granted 3 wishes and how he uses them will determine his fate—or will they? Things have changed for Rudy but he's not so sure it's for the better. He discovers a world where no one is home, his brother and sister are monsters, and his only hope is a creature named Cirrus. My Review- I was given this book by the author. I personally thought this book was very well thought out and had a great underlying message for children. 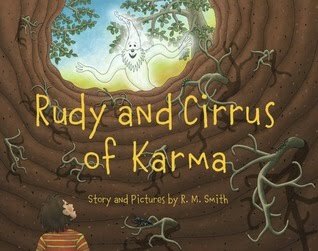 Rudy and Cirrus of Karma teaches children reasoning and that your actions do have consequences. I read this to my daughters and they loved the book as well. The illustrations kept there attention along with the story line. They were easily able to relate to rudy and reflect back on the times when they lied,stole from their sister etc...After finishing up the book I always have them summarize and tell me what they learned from the book and they were able to break it down just fine and got the moral of the story as well. They have asked me twice in the same day already to re-read the book to them.